How did you get interested in becoming a book conservator? Todd Pattison: I was very fortunate because I got interested at a young age. I took a bookbinding merit badge course [with the Boy Scouts] when I was 13 years old. Instead of making a new blank book, which all the other kids in my troop did, I had what I considered an extremely old book from the 1890s. It was called the Skeleton in the Closet, a kind of a trashy mystery book that didn’t have a binding. It was only years later that I found out the book was issued with a paper cover – it was that type of publication, very similar to a dime novel. 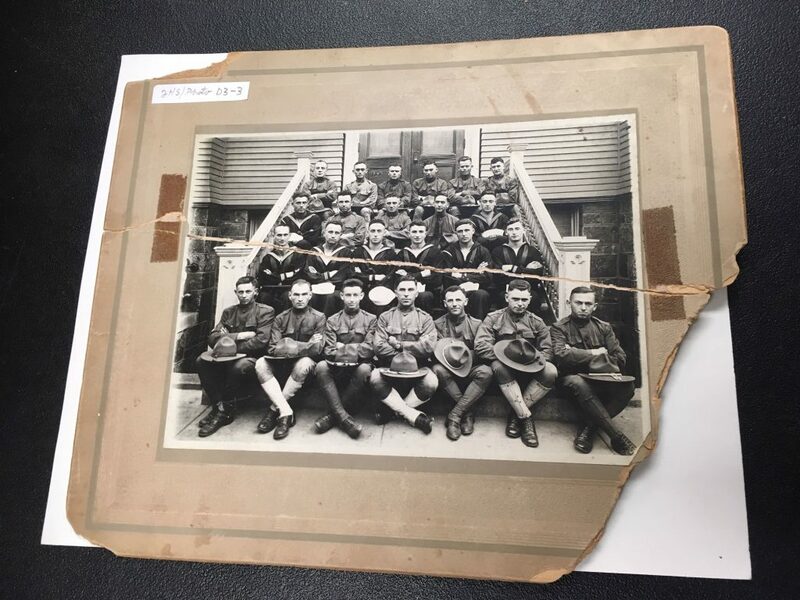 We were very fortunate because the father of another boy in my troop worked as a bookbinder and conservator, so we had an expert teaching the merit badge course. I was hooked immediately. How did you receive your training and how do you continue to learn new things? I ended up doing an apprenticeship with Fred Jordan, the person who taught the merit badge. He was very generous with his time, and for about four years I would work with him after school one or two days a week and on Saturdays and in the summer. By the time I was 16, he could tell that I was serious, and this was really a profession that I wanted to follow. So, we looked around at opportunities for after high school and talked to some people in the field. The best advice that we got was to attend a program in the Italian-speaking part of Switzerland, called Centro del Bel Libro, or Center of the Beautiful Book. The experience was quite exciting for me, as I’d never been on a plane before or anything like that. I studied there for a year and when I came back, I pursued an undergraduate degree in art history and then got a master’s degree in library science. 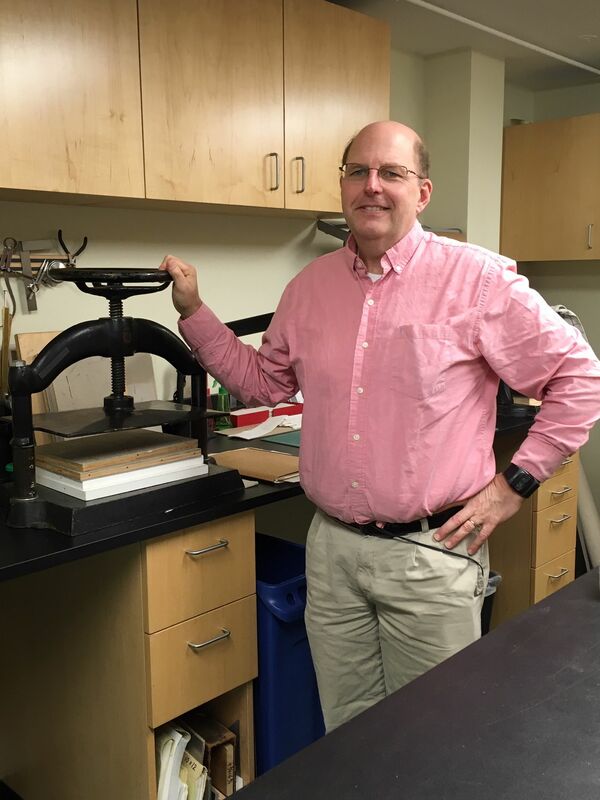 Most positions for a book and paper conservator are within a library, so a library science degree gives me a better understanding of how book collecting institutions work – and that allows me to make the best contribution of my own skills within that setting. I try to keep up with the field by taking workshops and talking with my peers. There’s a professional organization for conservation [AIC (American Institute for Conservation of Historic and Artistic Works)] which I’m a member of, and they have a yearly conference at which people present papers and share information. I’ve presented a few papers at this conference on my own conservation treatments and research; it’s very important to contribute and give back to the field. Are there commonly-heard myths about book and paper conservation which you would like to dispel? I think one of the big myths is that we just fix old things. Conservators do a lot more than just performing conservation treatment. Ideally, we would like to prevent as much damage as possible so that items don’t get to the point where they need treatment. Preventative conservation has become a field in and of itself within the conservation world, involving efforts to mitigate all the factors that might lead to a book or other object breaking down to the point where it needs conservation intervention. When an object does need treatment, conservators don’t just decide to fix it on their own. There’s a team of people involved with identification, decision-making, and follow-up. For instance, at NEHGS, we have patrons and staff who notice the damaged objects in the first place; a Collection Services team that facilitates a preservation review of objects and routes them to conservation; and we have curators who know the importance of the object and the story that it tells to guide the treatment decisions to best serve our members. As a conservator, what I really want to do is make sure the object can tell the story that it has, rather than put too much of our own time period, or too much of ourselves, into it. Another myth might be that there is only one way to treat an item. There are many ways to treat any item, and the same exact object held in two different institutions or private collections might receive very different treatments. Not only does the object have a story to tell, but each institution or collection has its own mission or story. Looking back over your career so far, what changes in the book and paper conservation world stand out to you? I think the big overall change is that we tend to treat less than we used to, and I think it’s partly from some of the things we just talked about. There was this sense that conservators were the people who fixed things, so if you saw a damaged or broken book or paper-based item, you repaired it. Now we know we can fix the damage, but we also know that it’s very nuanced and complicated, and that anything you do to an object is going to alter that object, however slightly. Our goal is to alter objects as little as possible, so they can retain all those interesting bits of information that make them resonate with people. We also try to focus on a bigger picture, so instead of just looking at individual objects and thinking ‘OK, How can I treat this object?,’ we’re trying, with limited budgets and limited time, to cover as much of the collection as we can. In our institution, we have more than 100,000 books and more than a million manuscript items, so how do we affect the greatest number of those items with our activities as opposed to just choosing a few things that we’re going to try to fix? Of course, we still need to treat items that people are currently using, but we must balance that with the preservation of the entire collection over the long term. What do you enjoy most in your job as Conservator at NEHGS? What I enjoy the most is working with my colleagues. They are such wonderfully dedicated people, trying their best to serve our members. I haven’t been here very long, and they’ve been extremely helpful in making sure not only that I’m settled here but that I have the resources I need to do my job. Besides working with my colleagues, I really do enjoy working with our collections. I’m very happy performing conservation treatments and doing the activities that will make our collections more useful for our members. They are ultimately the ones that will try to make meaning out of our collection materials. What is the most interesting item you’ve worked on so far at NEHGS and what has been the most challenging? Perhaps one item has been both! I’ve worked on a lot of interesting objects; almost all of them are interesting in their own way. They may be of interest because of their construction or the conservation and preservation challenges that they present. That might be another myth people have about conservators – that they tend to like the objects that are more important from an artifact or history standpoint. Personally, I like the objects that present a kind of puzzle, one I must figure out the most appropriate treatment for. I know what the condition of the object is, and the curator can tell me about the importance of the object and their goals and expectations for the item after treatment. It’s up to me to figure out how to do the conservation so the object gets from Point A, where it is now, to Point B, where the curator would like it to be, with as little change and intervention as possible. One of my favorite objects that I’ve treated is the captivity narrative of Mary Rowlandson, which was a very simple treatment. It just needed some pressure-sensitive tape removed from the title page, which was then mended with some thin, toned Japanese paper that was sympathetic to the original paper. Sometimes the simple treatments can be the most satisfying, because you leave the object looking very similar to the way it did when it came to the conservation lab. That was an eighteenth-century pamphlet that would have been very popular at the time and would have gotten a lot of use. Seeing that use in the object is not necessarily a bad thing, to know that people enjoyed it and read it, influencing their world view. One of the most challenging issues that we deal with in the conservation lab is pressure-sensitive tape, because there is a variety of strategies that may be needed to treat it. These could include mechanical removal, removal of the carrier using heat, or it may require the use of chemical solvents. Pressure-sensitive tape ages over time and the strategies for working on it might be different depending on how old the tape is or the properties of the tape when it was first manufactured, as not all pressure-sensitive tapes are the same. What is the range of time it can take for the Conservation Lab to treat an item, and what considerations factor into the amount of time it can take? It can take as little as 15 minutes to work on an item or it can take tens of hours. Most of the projects that we’re treating in the conservation lab take somewhere between a half hour and ten hours. One of the reasons they’re going to fall in that time range is because of the number of books and manuscripts that we need to conserve. We don’t have the luxury of being able to treat something over the course of months, as we need to make sure that researchers can have access to material when they need it. NEHGS has its own mission which differs from another institution, such as an art museum, where the aesthetics of an object are so important. Most of our material is informational, so we’re treating that material appropriately, making sure that we’re retaining all the information and keeping the object functional. I know you have a personal research interest in nineteenth-century American bookbindings? Can you describe what it is that fascinates you about them? When I was young, I tended to be drawn to earlier American bindings – leather bindings from the eighteenth century. Aesthetically they’re very pleasing, but as I started to learn more about the history of the book in America, I realized that the interesting time period really is the beginning to mid-nineteenth century, when bookbinding changed radically in a short amount of time. Before the nineteenth century, bookbinding establishments were quite small, with maybe a master binder and a journeyman and a couple of apprentices, but by the time you get into the mid-1800s, you have some bookbinding establishments that employ more than 200 people. That change was partly caused by changes in papermaking and printing, both of which went through an explosion of growth, so bookbinding became this bottleneck which out of necessity had to change. How they made that change, how they adapted – how book structures, as well as the aesthetics of bindings, changed – is, I think, incredibly fascinating. It’s the most dynamic period for bookbinding in the past 500 years. New staff members at NEHGS receive a consultation with a genealogist, in which they sit down together and discuss a genealogical research question. What did you choose as the topic of your consultation and what did you learn? I chose Joseph Altemus, who was a bookbinder in Philadelphia in the second quarter of the nineteenth century; he died unexpectedly in December 1853. He ran quite a large bindery, and they produced some of the most interesting bindings that I think you would find from that period, but very little is known about them, mostly because they didn’t sign their work. This makes it especially difficult to identify bindings as being from the Altemus bindery. I wanted to know more about Joseph Altemus’ life and how that related to his bookbinding business. In particular, there’s a gap of four years, between 1840 and 1844, where he’s not listed in any Philadelphia directories as a binder. What was going on with him at that time and how did he come to own one of the largest binderies in Philadelphia a decade later? He dies intestate and since he had a partner, his uncle, they had to do an inventory of the bindery. This is very rich information, knowing exactly what was in the bindery at that time, which is how we know the size, what they were working on, the machines they used, and the kind of materials they were working with. Were you able to fill in any gaps? Not really; it’s tricky. I’m researching him with the Chief of Conservation of the Library Company of Philadelphia, Jennifer Rosner. She has done a lot of the genealogical background, but it’s hard to get to some of those missing details when there’s a gap of four years in someone’s life. We just don’t know exactly what he was doing in that time. There was a financial panic and recession in 1838 which did affect the book industry, so there were certainly fewer books being printed. I know some binders went out of business at that time and it might have been that he had a financial setback. Photograph of Army and Navy personnel from Lynn, Mass., ca. 1918, from the Records of the Jewish Heritage Center of the North Shore at the Wyner Family Jewish Heritage Center at NEHGS. What would you like people to know about the NEHGS Conservation Lab? Todd examining the photo to determine conservation options. One of the things I would like people to know is that we treat more than books, although my specialty is in that area. We have a fine art collection, we have a manuscript collection, we have photographs, and I’m tasked with trying to make sure that we’re the best custodians for those materials that we can be. In some cases that means I would work directly on them, especially if they are paper-based. 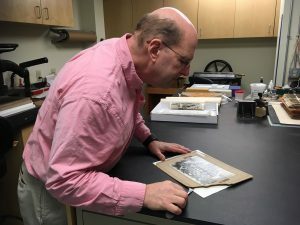 Most photographs are on a paper substrate, so some of the treatment is very similar to paper and some of the fine art collection is also paper-based, so it falls within my scope as conservator. Some of the non-paper-based materials need very simple preservation activities, like new hanging wire for framed objects. So, I do work on things besides books here, although we also use outside conservators for materials like paintings and textiles, because they require their own specialized training and conservation treatments. Thank you for your time, Todd! I enjoyed the article. I had to teach myself how to do book repairs, out of necessity because I often purchased older used books, as part of my family history research. I enjoy the self satisfaction I get when I’m able to repair something and make it usable again. My most challenging project was creating a casing for a 1928 book that was originally only soft covered. I took this approach because I knew it would be one of my most go to research books and one that would eventually be passed down in the family. Thank you for your comment, Pete. It sounds like you’ve taught yourself quite a lot! It must feel good to know that the book has a better chance of surviving for future generations to use and appreciate. VERY interesting article. I am registered for the next webinar & it will be very informative I’m sure. I look forward to these articles & enjoy them all. Thank you @ American Ancestors for .this series. Thank you, Barbara! I’m so glad to hear you will be watching Todd’s webinar. It’s going to be chock-full of good information. Thanks for this informative and interesting interview. I have a book that I think Todd would find interesting. One reason that it is interesting to me is that the book was printed by my 5th great grandfather, James Delahoy of Deptford in Kent, England, in 1793. Another interesting aspect is the subject of the book, as revealed by its title, Memoirs of Science and the Arts or, An Abridgement of the Transactions Published by the Principal Learned and OEconomical Societies Established in Europe, Asia, and America. The binding of this book is interesting because the book is still bound in the original “sugar-paper covered boards” in which books at that time were typically sold. It seems that purchasers of a book typically took the book to a binder to be bound after purchasing the book. Printing and book binding were two separate operations. One can read Harvard’s copy of this book, the two parts bound separately, on HathiTrust, https://catalog.hathitrust.org/Record/009713073 (digitized by Google). Together the two parts are 543 pages plus appendix and index, and include elaborate diagrams, tables, and pages of complicated equations. Thank you, Janet! I will be sure to share this with Todd. Welcome, Todd Pattison! Introducing new staff people is a great idea. I am looking forward to the webinar. Thank you for your comments, Rose. It’s always nice to hear from you, and it’s great to know that you will be attending the webinar. Enjoy! Wonderful article. I am the editor of a newsletter for the Summit County Chapter of the Ohio Genealogical Society. I am going to provide the link so that others may read it, if my advice is followed. Jean – Comment on color font (not for adding to notes unless you want to) – One paragraph starts with, “One of my favorite objects that I’ve treated is the captivity narrative of Mary Rowlandson, which was a very simple treatment.,” where ‘captivity narrative of Mary Rowlandson’ is in a reddish type. I do not know about others but when reading that on paper, that color was hard to see; I had to bend the paper and squint. May I suggest another color be used in these circumstances?